Chances are you’ve seen the bright pink egg-shaped beauty sponge all over the place lately and if you haven’t tried it yet you may have at least wondered what’s so great about these little wonders. I was one of those people and I admit it…I resisted the fad for awhile thinking it was a waste of money. I was wrong! Beauty Blenders are latex free and hypo-allergenic beauty sponges used to help apply a full range of makeup and beauty products flawlessly. Beauty sponges aren’t anything new, but the materials used for this one along with the unique egg-shape help make this an exceptional tool to add to your beauty routine. They can be used dry (which I have done when applying powder products like a powder foundation), but are usually used damp (wet sponge and then towel dry to remove excess water). By using the bounce technique (also known as stippling) you will achieve flawless and seamless application of your makeup. I usually use the bigger end to apply liquid foundation and the smaller end (point) to apply products like concealers, highlighters, or to get in to smaller areas of the face. 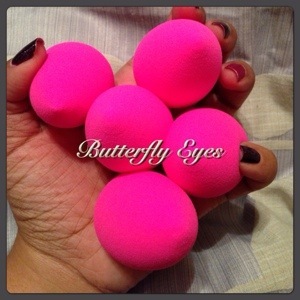 Beauty Blender sponges come in the original pink color, white (pure), or black (pro) and can be purchased individually or in sets. The prices range depending on retailers but can start at around $19. Pros with access to pro discounts at various retailers can usually get even better deals. 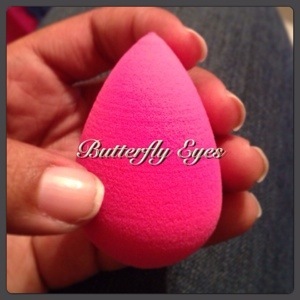 Beauty Blender also offers a cleanser for their sponges that can also be used to clean makeup brushes. It comes in both a liquid form and a solid form that is great for travel. The cleanser is soy based and dye-free. It has a fresh scent that’s not overpowering. You can purchase the cleanser separately or in a set, but it is not required for the Beauty Blender. The liquid cleanser comes on 3 Oz or 6 Oz bottles while the solid comes in a 1 Oz container. Overall, I definitely recommend using the Beauty Blender sponge. If properly cared for you can get 2-3 months of use out of a sponge before you need to dispose of it (more frequent use or if you are rough when cleaning it may lessen your sponges lifetime). A minor note about cleaning….it is perhaps the one thing I dislike, but I have found a method that makes it a little easier. I found that if I wet the sponge, apply some cleanser, squeeze it a few times to allow it to lather, and then let the sponge soak in warm/hot water for awhile before fully cleaning it, it is easier to get all of the product out of the sponge without going through a ton of cleanser OR repeatedly having to lather and rinse. I often just start this as soon as I finish applying my makeup and leave the sponge to soak until I get back (which can be hours). It doesn’t harm the sponge or cause any damage. Another side-note. I don’t generally discuss customer service issues but his particular incident almost caused me to reconsider my willingness to use this product any longer. In the end, my decision has been to no longer directly purchase from Beauty Blender’s website (beautyblender.net) due to the extremely poor customer service experience I had during their Black Friday sale and the poor communication (and at one point, flat out lies I was told via email from both a representative AND the VP) that affected my own work related travel plans. Because of this, as much as I give glowing praise to the Beauty Blender as a product I do NOT advise ordering from Rea.deeming Beauty Inc (beautyblender.net). When possible I advise readers to purchase from other retailers such as Sephora, Frends Beauty, Nigel’s Beauty Emporium, or other retailers. If you are a MUA or other pro I suggest Frends or Nigel’s for their pro discounts (or any of the other pro friendly retailers) or taking advantage of any of the pro orientated trade shows where some of these retailers would be present such as The Makeup Show or IMATS. This entry was posted in Beauty Blender, Brands, Product Reviews and tagged Beauty Blender, Beauty Blender Cleanser, beauty blender mini pro, beauty blender pure, beauty sponge, black beauty blender, liquid beauty blender cleanser, original beauty blender, pink beauty blender, solid beauty blender cleanser, white beauty blender.